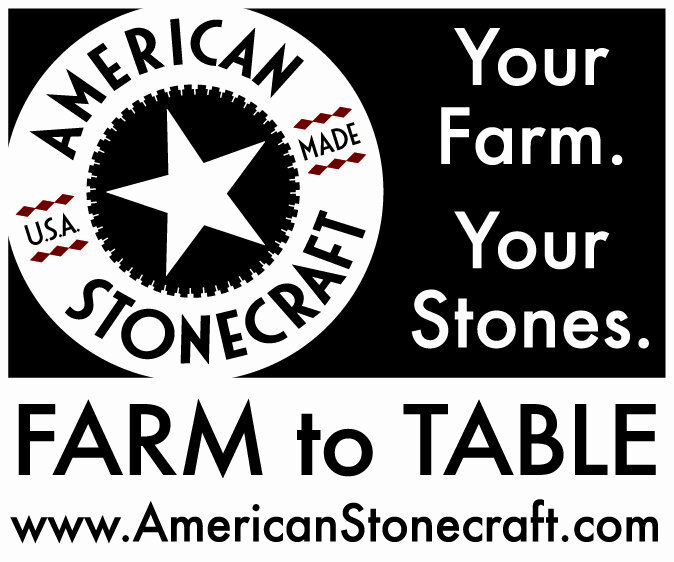 Although we live in an age where focus is on convenience, creating a meal completely from scratch is not only personally gratifying to see each component come together in perfect harmony, but the quality of a meal created without using pre-made ingredients is fresher and tastes better. 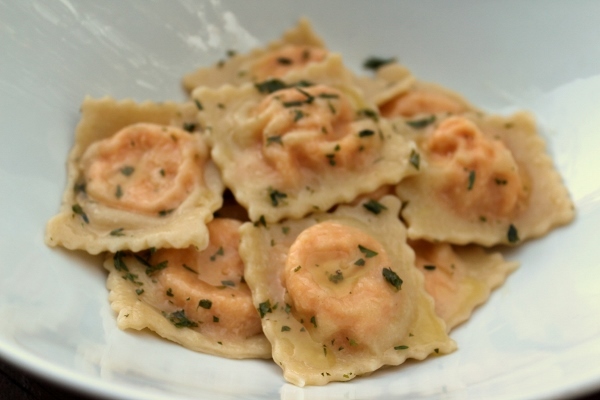 I recently shared a recipe for Candy-Wrapped Tortelli which featured Swiss chard from my parents' garden, local tomatoes, homemade ricotta and mascarpone cheeses, and homemade pasta dough. I mentioned in that post that I also made another stuffed pasta that same day. Today I'm sharing that second recipe! 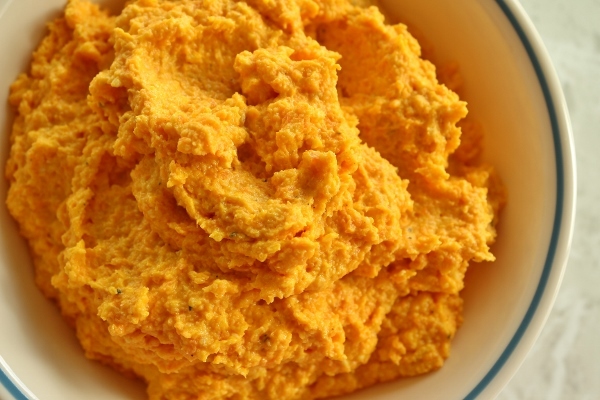 Carrot and ricotta may sound like an unusual ravioli filling, but if you think about other sweeter vegetables such as winter squash or sweet potatoes that can fill pasta, carrots make perfect sense. They are covered with foil and gently roasted, ensuring they will puree smoothly with the other filling ingredients. The original recipe has you puree the carrots with sauteed shallots and a little bit of cream, but I felt the filling would be smoother if I also pureed the ricotta and other ingredients right into it. My homemade ricotta was very thick and wouldn't have yielded a smooth filling had I just mixed it by hand (and also the carrots would be less smooth as well). 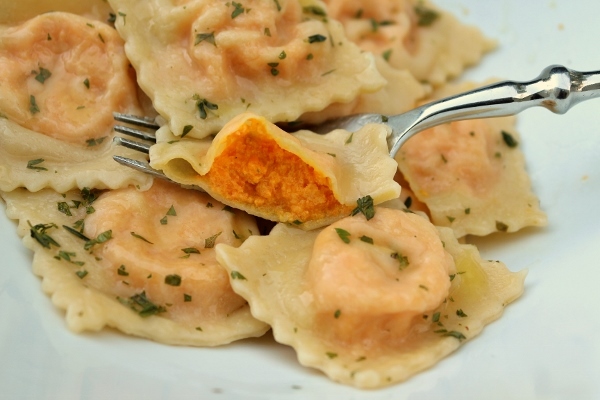 The filling for the ravioli is delicious! It has a great sharpness from the addition of Parmigiano-Reggiano, or in my case Pecorino Romano, and a wonderful creamy carrot flavor balanced out with the mild fresh ricotta. 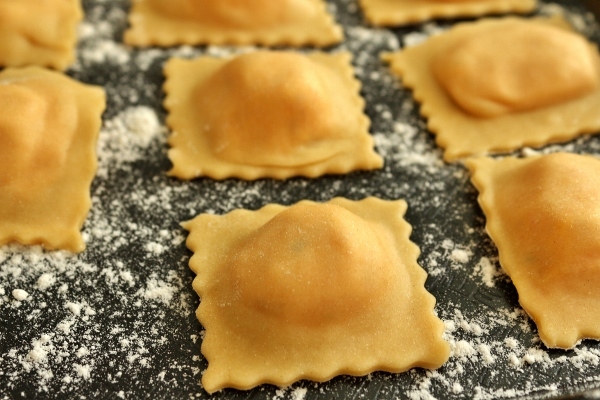 You could easily use this filling for other shapes as well (such as the beautiful candy-wrapped tortelli), and I even assembled the ravioli a bit differently than the original in the book, which shapes them into half moons instead of squares. 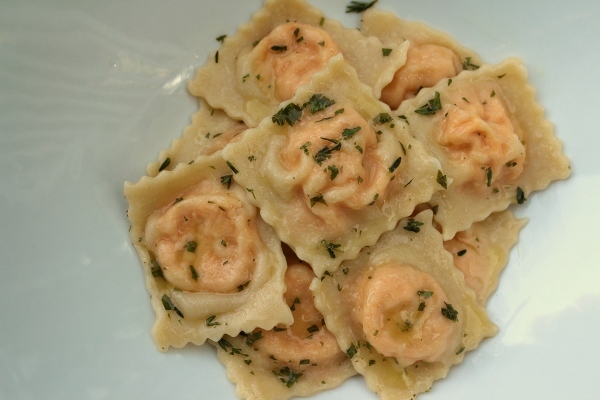 I actually had some leftover pasta dough scraps after assembling these (perhaps I went a little heavy on the filling for each square) and used those scraps for my candy-wrapped tortelli because I had excess Swiss chard filling. The delicate carrot and ricotta pillows are served with a simple herbed butter; anything more assertive would overwhelm the ravioli. I simply used parsley and thyme because I had them in my fridge, but try using a variety of herbs available to you to impart different flavors to the butter. In any case, the filling definitely stands up on its own, and it's beautiful and vibrant peeking out of the thin pasta encasing it. To make the filling: In a baking dish, toss the carrots with the olive oil and season with salt and pepper. Cover with foil and bake for about 30 minutes, until tender and lightly browned. Let cool slightly. In a small skillet over medium heat, melt the 2 teaspoons butter. Add the shallot and cook until softened, about 3 minutes. Remove from the heat and let cool slightly. 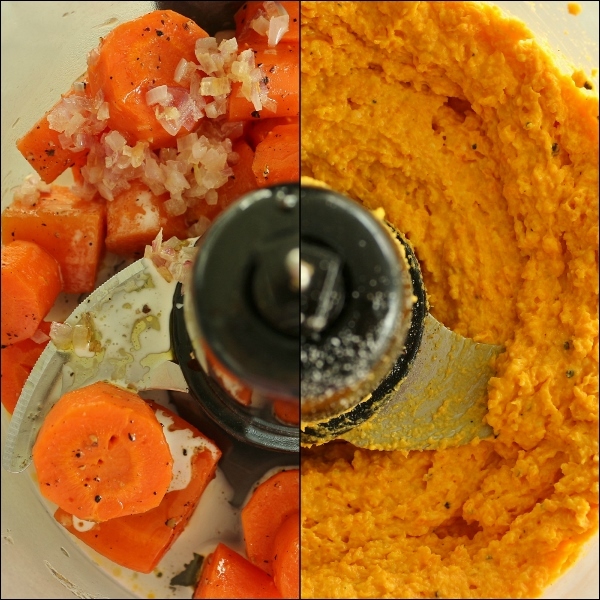 In a food processor, combine the carrots, shallot, and cream and puree until smooth, scraping down the sides as needed. Add the ricotta, Parmigiano, nutmeg, and egg yolk, and season with salt and pepper. Puree until combined. Cover and refrigerate filling until needed. Filling can be made a day in advance. Sprinkle a work surface and a few trays or sheet pans generously with flour (where you can place assembled ravioli when finished). Have on hand a fluted pastry wheel for cutting out the ravioli and a glass of water for wetting your fingers or pastry brush. Cut the ball of pasta dough into four equal pieces and rewrap three pieces. Roll out the remaining pieces of pasta dough into a long, thin strip (1/16-inch thick--#5 on a Kitchenaid pasta roller attachment is good). The strip should be 28 inches long and 5 inches wide. Carefully lay the strip on a work surface dusted with flour. Mound about 1 1/2 teaspoons of the filling at 2-inch intervals in two parallel rows on half of the dough. Dip a finger or small pastry brush in the water and moisten along the edges of the dough and in between the rows. Carefully fold half the dough width-wise, gently pressing out the air and nudging the mounds as you go so that the dough completely covers the mounds when the top and bottom edges meet. Gently press around the mounds with your fingers to seal them. 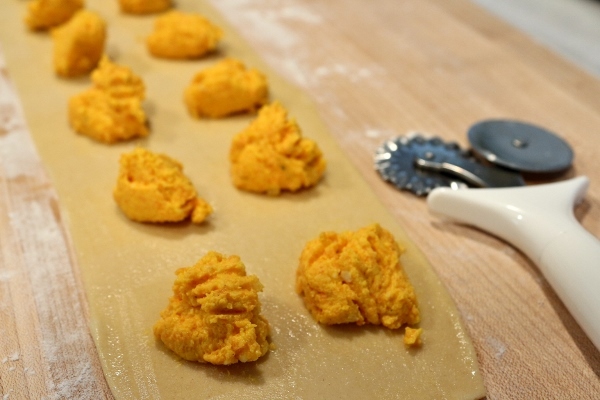 Use a pastry cutter to cut ravioli into squares. (Alternatively, you can line the mounds of filling completely along the length of the dough and then fold it gently lengthwise, then press, seal, and cut the ravioli). Once you have finished cutting the ravioli, gather up the dough scraps, press them into a ball, and put them in a plastic bag. 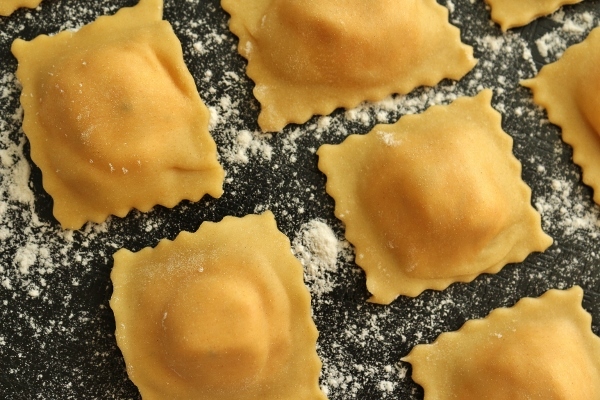 Transfer the ravioli to the flour-dusted trays. Continue to stretch out, fill, and shape the remaining dough pieces, collecting the scraps as you go. Reroll the scraps once to form additional ravioli (I actually used my dough scraps to make extra candy-wrapped tortelli because I made both on the same day and had more of that filling requiring extra dough). To make the butter: Bring a large pot of water to a boil over high heat and salt generously. While the water is heating, melt the butter in a small skillet placed over medium-low heat. When the butter begins to sizzle, stir in the herbs and a pinch or two of salt and cook, stirring for 2 minutes, or until the utter has taken on the flavor of the herbs. Turn off the heat and cover to keep warm. When the water is boiling , carefully drop the ravioli into the pot--you may need to cook them in two batches to avoid crowding. Cover the pot until the water returns to a boil and then uncover and cook the ravioli for 3 to 5 minutes, until they are just tender. Gently stir the water once or twice to make sure the ravioli do not stick together. 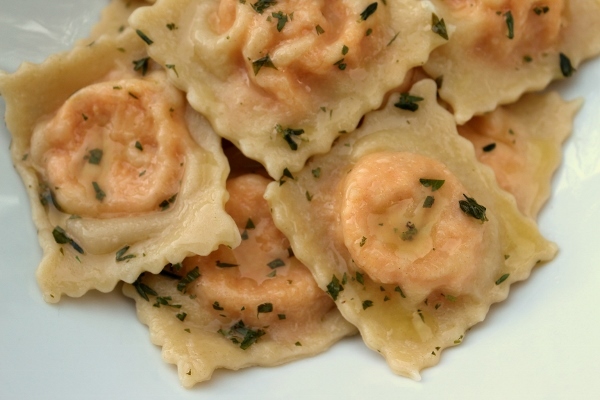 Using a slotted spoon, gently remove the cooked ravioli from the pot and place in a mixing bowl. Pour the herbed butter over the top and gently toss to coat. Serve immediately with Parmigiano cheese on the side. 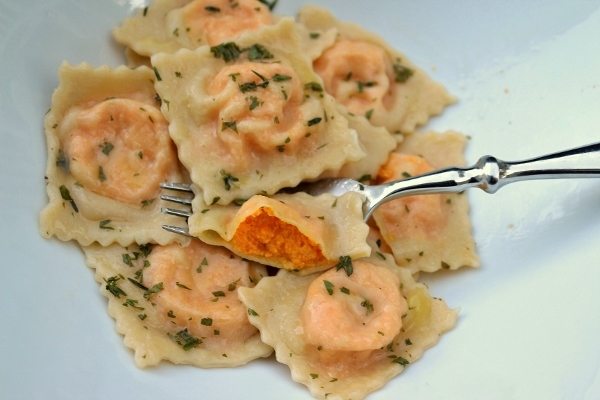 The uncooked ravioli may be frozen for up to 1 month: freeze on a large baking sheet in a single layer until firm, then transfer the ravioli to ziplock freezer bags or a container with a tight-fitting lid and return to the freezer.